Beautiful landscapes need all the care you can offer them. Green Leaf offers its clients year-round landscape maintenance comprising of regular and seasonal activities covering all vegetal and hardscape elements on your property. Our year-round services address the beauty, functionality, and health of your property. If you need full landscape maintenance for your property, here are the things you should know about our services. While we can build you a beautiful, sustainable, and long-lasting landscape for you to enjoy together with family and friends, we can also make sure your property preserves its best features and reaches its maximum potential. 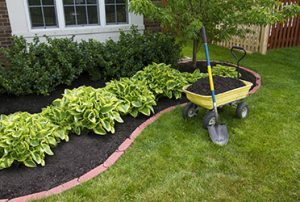 Mulching: flowerbeds and trees (and we only use sustainable solutions) to protect and nourish the vegetation roots and offer your landscape the aesthetics of your property. Tree injections: since trees are the pillars of your landscape and they sustain the resilience and health of your vegetation, we offer robust injections on a rotation cycle to contain and prevent tree pests and diseases. Our doses are environmentally conscious and safer than other similar methods. We continuously invest in the latest technologies, equipment, and training to offer you the best and safest the industry has to offer. We provide clients with free estimates. No matter what type of service or services you require, we will make sure to present you with a thorough plan and strategy. We are reliable and honest, transparent in all our actions, and oriented towards our clients’ satisfaction. Our experience, customer service, working portfolio, certifications, and licenses recommend us as the most reliable landscaping company in your area! Of course, you should not take us at face value, but put us to the test! We are always willing to come over for an evaluation and for extended talks regarding your vision and the ways we can make it real! If you are looking for hardscaping services in Ithaca, Cortland, Syracuse, Binghamton, and the surrounding areas give us a call, plan a visit, ask for a free estimate and let us turn your property into a veritable corner of paradise!